It’s something none of us like to take for granted – the roof over our heads. But when it comes to roof maintenance, it’s a chore which can be easily overlooked. And it’s an oversight that ends up costing us big time when the average roof replacement tops over $7,000. The good news is, roof maintenance doesn’t have to be an issue. With a regular inspection, you not only save money from avoiding a replacement, but you can also save money in other ways too! Curious to know how? Read on to find out 5 ways you can save money with roof maintenance. The unexpected is a part of life. But it doesn’t have to be when it comes to your roof. If you neglect to maintain your roof, you may not notice those loose shingles in the back of your house. Or even the missing ones on the side of the house you rarely walk around. But when a storm blows through and takes those shingles off, sending driving rain on an unprotected spot, you’re going to find out about it real fast. And your small problem has snowballed into a costly one. The kicker is, it’s completely avoidable. Calling a professional out for routine inspections can save you from expensive issues. Or at the very least, take a ladder out and regularly take a look. Examine your roof for cracked, curling, or those pesky loose shingles. Check out the flashing to make sure it still looks good. And keep an eye out for any signs of algae, fungus, or pest issues. 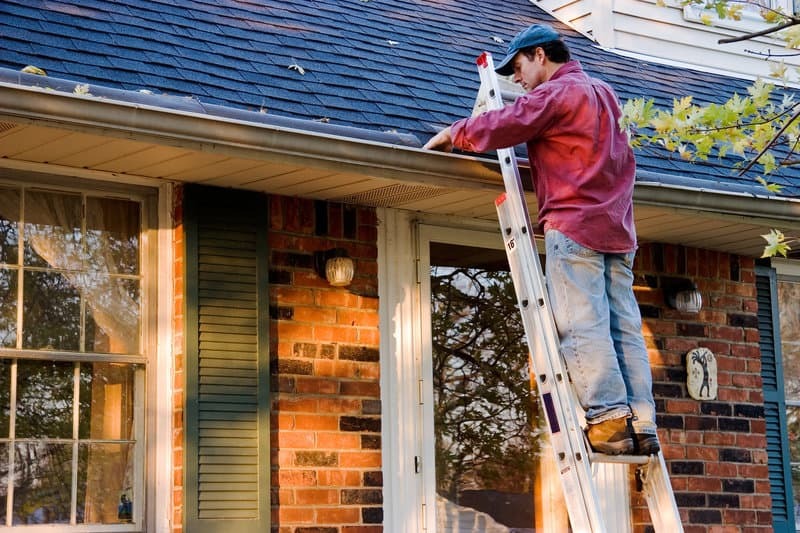 Once you’re off the ladder, walk around the house and look for shingle pieces or their granules on the ground. Get into your attic and look for water damage or leaks. A little bit of time and care can save you a lot of money in the long run. Whether you just replaced your roof or it’s something you did years ago, you want to protect your investment. And with regular roof maintenance, you’ll not only extend the life of that investment, but you’ll also save from having to replace your roof sooner than you should. Your roof takes a beating. Sun exposure, wind, weather, pests… it all contributes to wear and tear. And over time, this shortens your roof’s lifespan. Luckily, there are things you can do to slow the process down. Clear away any debris collecting on your roof. Leaves, tree branches, and items which may blow in can collect moisture or pests causing damage. Clean your gutters. If debris blocks the flow of water, that water can back up, causing leaks and added moisture damage. Only walk on your roof when necessary. Most people don’t realize foot traffic will shorten the life of their shingles. Shoes can thin the granular layer your shingles need. There’s been a storm and your roof needs major repairs. Filing a claim with your insurance company should be easy, right? Think again. Read the fine print. Many insurance policies want you to keep a well-maintained roof before they will pay out for any repairs. The same holds true for warranty coverage. That’s because they can easily explain the damage wouldn’t have happened if the roof had been cared for. And they won’t pay for your neglect. This mistake will leave you responsible for the large bill. Re-read any policies you have on your roof and make sure you know what’s expected. It may mean you need to have your roof looked at after any major storm. Some roofing warranties ask you to get a professional inspection every year or so. If you have maintenance paperwork from a professional to back you up, the process of filing a claim will be less stressful. And more importantly, will save you money. You’ve put your home on the market and are ready to make top dollar for it. But if you have a shoddy roof, it could send potential buyers running far away. First, it could turn buyers off by the mere appearance of it. Broken shingles, stains, and a wavy roof line can plummet your curb appeal. A buyers first impression will be that your home isn’t well-maintained… and they haven’t even made it through the front door yet. Second, a poorly kept roof will make a buyer see dollar signs – and not in a good way. No one wants to move into a house and instantly fork over the expense of replacing an entire roof. And that means it will come out of your pocket. Either by replacing it yourself before you put it on the market or by lowering your asking price. Not keeping your roof in tip-top shape will cost you money. It’s easy to think roof damage only affects your home’s structure. But don’t forget about the stuff INSIDE your house. Water damage can wreak havoc. It silently seeps through ceilings and into your walls until it finds its way out into the open and onto your belongings. And not only will you be dealing with water damage, but you will also now have to fight mold. Whether that’s a bedroom located underneath a roof leak or the attic where you store all your keepsakes. Your property damage will extend to more than your house. Protect your family’s belongings. Have your roof maintained to stop leaks before they ever have a chance to start. Because saving your valuables is more than saving the money to replace them. It’s saving the memories that go along with them. You work hard to keep a roof over your family’s head. Protect your investment with regular roof maintenance. It’s a little bit of effort that will go a long way to saving you money. Ready to schedule maintenance on your roof? Contact us today! Our family-owned business would love to put our professional experience to work for you.